In 1991 Ukraine became an independent nation. For the first time ever in its long and conflicted history it had finally achieved statehood. Casting aside the yoke of foreign rule led to many changes in the nation, nowhere more so than in Lviv. Soviet symbols were quickly removed. Tourism became one of the major economic engines. The historic Old Town was renovated, along with several other areas in the city. The changes have accelerated since those heady days following the Soviet collapse. The Orange and Maiden Revolutions were acutely felt in the city as citizens spilled into the street, protesting for weeks on end to combat bad governance and corruption. Lviv gained a nickname, “the most Ukrainian city in Ukraine” due to its role as a major force in creating a national identity. One transformation brought about by Ukrainian statehood and that has surprisingly lasted has been street names. The fact that most of Lviv’s streets have kept the same name given them following Ukrainian statehood is characteristic of a degree of stability lacking in other areas of the nation, especially the East. It also just might signal the end of a centuries-long process – accelerated during the chaotic 20th century – where Lviv’s streets underwent a withering number of name changes. It has been said that war is a great innovator. In the case of Lviv’s street names, war has been both a great degenerator and regenerator (portmanteau words). 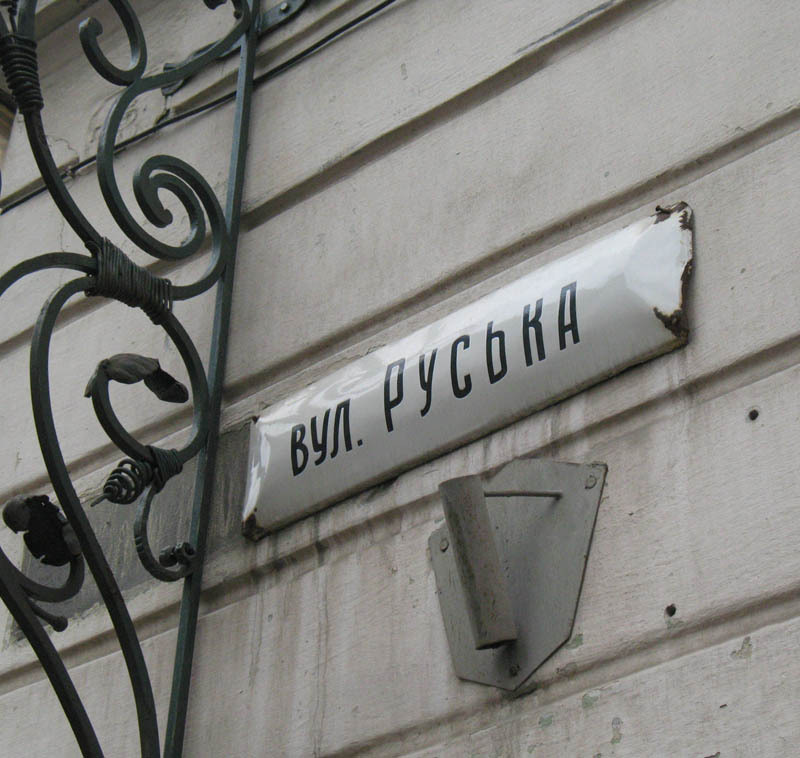 The degeneration occurred when street names were changed to reflect the heroes of Nazism and Stalinism. The regeneration took place as new names reflecting the dominant Ukrainian presence in the city came to grace the streets. These name changes were far from the only ones. The situation regarding name changes has been fluid over the last couple of centuries as conquerors, whether by treaty or military force, occupied the city and proceeded to put their own superficial stamp on the city. Nowhere has this been as true as in heart of the city center. Prospekt Svobody, the grandest boulevard in Lviv has undergone no less than 17 name changes over the past 200 years. Transliterated the current name means Liberty Avenue which seems appropriate since the boulevard was the setting for mass protests to liberate Ukraine from cronyism and corruption twice in the last twelve years. Yet for thirty-one years (1959 -1990) Prospekt Svobody was named Lenin Avenue, after a man who stood for the opposite of liberty. The same was certainly true of Adolf Hitler. The Nazi dictator’s name was given to the boulevard for much of the German occupation of Lviv during World War II. The names of these blood soaked ideologues were added to the boulevard in due course as a symbolic reminder to Lvivians of the ideological force exercising control over the city. The first German names given to the boulevard following the invasion, Museumstrasse then Opernstrasse, were likely dropped because of their banality. In prior decades the Polish presence in the city informed two martial names for the boulevard, first Hetmanska then Legionow. While both were serious and forceful names, they were much more ideologically moderate than the names of those tyrants that were to soon follow. The Habsburgs named the boulevard after a lesser light of the ruling family, a figure who today is all but overshadowed by his son. Archduke Karl Ludwig was once a name on the lips of every Lvivan who strolled along Karl Ludwig Strasse. He was the brother of Emperor Franz Josef and for a short time was part of the Galician provincial government that called Lviv home. If Karl Ludwig is remembered for anything today, it is as the father of Franz Ferdinand, the man whose assassination sparked the First World War. 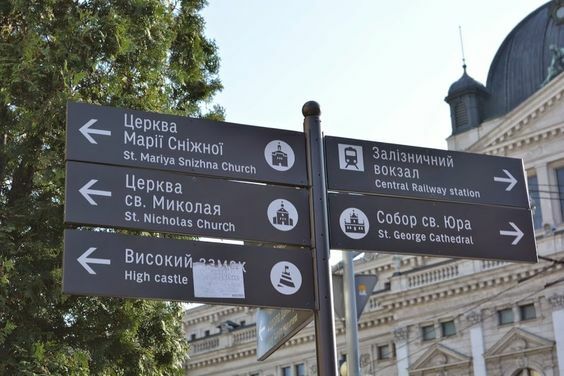 Another famous street in Lviv has managed to have more name changes than Prospekt Svobody. Ivan Franko Street, including separate parts of it, has gone by no less than 28 names since the late 19th century. Today it is named for one of Ukraine’s most beloved sons. It is fitting that Franko, who was born in Galicia and spent part of his life in Lviv, ended up with one of the city’s most important streets named after him. Less known is the fact that Franko died lonely and impoverished in the city. Interestingly the street was named for him not after Ukrainian national independence, but following the Soviet reoccupation of the city in 1944. Franko was one of the few individuals considered a hero to both the Soviets and nationalistic Ukrainians. The Soviets recognized him for his promotion of socialism and worker’s rights. Ukrainians revere him today because he advocated for their rights, against the oppressive rule of aristocrats, capitalists and Polish elites. He received the honor of having the entire street named for him. This is unlikely to change. Speaking of street names unlikely to change, the endurance of Krakivska Street in the Old Town goes against the trend of name changes in Lviv. Despite the virulence of anti-Polish forces during World War II, culminating in the expulsion of ethnic Poles from the city in the war’s immediate aftermath, the street has maintained this name since the mid-15th century. In medieval times, the name denoted that this was the street which led to Krakow. The only changes to the name have been the various transliterations of it into the languages of the ruling authorities. Even the Germans called it Krakauerstrasse. One other Old Town Street that has only experienced a bare minimum of changes is the short – both literally and physically – Ruska street, which extends from the southeast side of Rynok Square to Pidvalna Street. The name was first given in 1472. This was the main street going through the Ruthenian (a pre-20th century term for Ukrainians) section of the Old Town. There is poetic justice in the continual use of this name. It staying power is representative of the unbroken presence of the Rus’/Ruthenian/Ukrainian people throughout Lviv’s history and their ability to survive the changes both superficial and geo-political which have transformed the city. Though names, loyalties and identifications have constantly changed in Lviv, the Ukrainian people have always remained. The majority of churches in Lviv’s Old Town seem to have one thing in common, namely that their wooden predecessors were reduced to ashes by fire. They were then rebuilt in stone, a material that could withstand both the ravages of fire and time. On multiple occasions, destruction by fire was followed by reconstruction. Later when the stone proved to be longer lasting, the churches would undergo restoration rather than rebuilding. This was certainly the case for the Latin and Dominican Cathedrals. This was also true for the Dormition Church (Church of the Assumption of the Blessed Virgin Mary), but there was a notable difference. The stone one that survives today was also nearly lost to a fierce conflagration in 1627. The walls were so badly damaged that it was a minor miracle when the church escaped demolition. The fact that the church still stands at present in the Old Town is a because of faith and devotion. 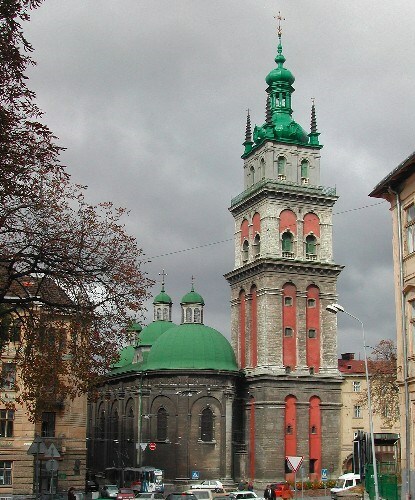 The Dormition Church reflects the Ukrainian population it has served throughout the centuries in Lviv as a symbol of survival and perseverance. 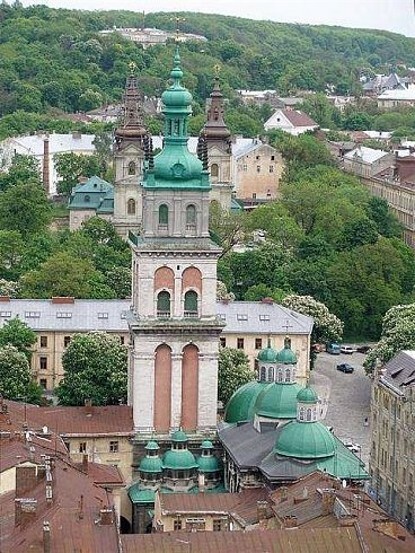 Many people believe that Lviv only really became a Ukrainian city following the Second World War. This was when the Soviets forced the majority Polish population out of the city. Moving them westward into lands that had been taken from Germany and would become Polonized. At the same time, tens of thousands of Ukrainians and to a much lesser extent Russians were moved into Lviv. By the late 1940’s Lviv had become a majority Ukrainian city. This was only new in a modern sense, as it actually hearkened back to the first century of the city’s history. Prior to conquest by the Poles in the 14th century, Lviv had been home to eastern Slavic peoples, ancestors of today’s Ukrainians, which historically were known as Ruthenians (the term was used right up through World War I). It was only after the conquest of the Kingdom of Galicia-Volhynia by the Kingdom of Poland that large numbers of Poles and Germans, Armenians and Jews settled in the city. Prior to the conquest, a predecessor of the Dormition Church, the Most Holy Mother of God Assumption Church existed in the city. It was the presence of this church, in various forms and architectural styles through the centuries. that gave the Ukrainians a lasting foothold in the city. Despite their marginalization, the Ruthenians did have a certain area allotted to them within the city walls that were built around Lviv following the Polish conquest. Unfortunately this area was exceedingly small. It was known as the Russin quarter, situated between the eastern city walls and Rynok Square. The most famous thoroughfare in this area was Solianykiv Street (present day Ruska Street) on which the Dormition Church still stands today. This was where Ruthenian merchants traded in salt, the community’s main economic engine. Even with the salt trade, the Ruthenians were often in desperate financial straits. For example, to build the immediate predecessor of the Dormition Church that stands on the spot today, the Ruthenian community had to solicit donations from fellow Orthodox believers abroad. A patron came forward, the Moldavian Hospodar (Lord) Alexandru Lapusnenanu, who donated the money for construction. The church is still referred to by many as the Wallachian Church, as Moldavia was then known as Wallachia (in present day Romania). Lapusnenanu also extended an invitation to Orthodox Lvivans to send young church singers for training in Greek and Serbian chants in Moldavia. The church served the community for two decades before it succumbed to fire in 1571. This led to another call for funding. Patronage for yet another Dormition Church, much more elaborate than any of its predecessors, would come mostly from funds donated by the Lviv Dormition Brotherhood. It was the most powerful pro-Ruthenian organization in Lviv. The brotherhood was formed in the 15th century as an Orthodox religious association at the Dormition Church. At its height during the Renaissance, it operated with a wide degree of latitude, only answering to the Orthodox Patriarch in Constantinople. The Brotherhood oversaw the local bishops and clergy, while propagating a variety of capitalistic and charitable enterprises. It owned one of the first printing presses in Ukraine and operated schools, hospitals and even rest homes for the elderly. It provided the financial resources to build a new church that would become a hallmark of the city’s Renaissance architecture, a structure that could withstand trials by fire. The Dormition Church that was thus created and still stands today took forty years to craft out of white hewn stone. The time span of construction is irrelevant when compared to the finished product that turned out to be a timeless and eternal piece of architecture. This masterpiece is still in use and welcomes visitors today. The design recalls traditional Ukrainian wooden churches with the structure being divided into three stories and three parts with three cupolas topped by lanterns. Reliefs frame high windows set into ultra-thick walls. Due to the height of the windows and thickness of these walls, it is believed that the church was also used as a fortification. The major donors were honored with their emblems decorating the central dome. The Chapel of the Three Baptists, adjacent to the church, is no less a feat of Renaissance style with its charismatic decorative façade. Soaring above the church and chapel is the Korniakt Tower. The entire ensemble of church, chapel and tower fuse the best of Ukrainian sacral architecture with the gloriously splendid style that exemplifies the western European Renaissance. From an architectural standpoint this is where Eastern and Western Europe merge stylistically to create an architectural feat for the ages. The Dormition Church is the cornerstone of this creation. A monument to faith that also symbolizes the Ukrainian people’s enduring presence in Lviv. Today, Lviv is known as “the most Ukrainian city in the Ukraine.” For seven centuries, the city was anything but that. The power of persistence, the varying fortunes of history and an abiding faith allowed Ukrainians to overcome innumerable obstacles, whether political, economic or environmental, to make the city truly their own. The greatest symbol of their ability to rise from the ashes, to recreate themselves and their public space stands at 7 Ruska Street. 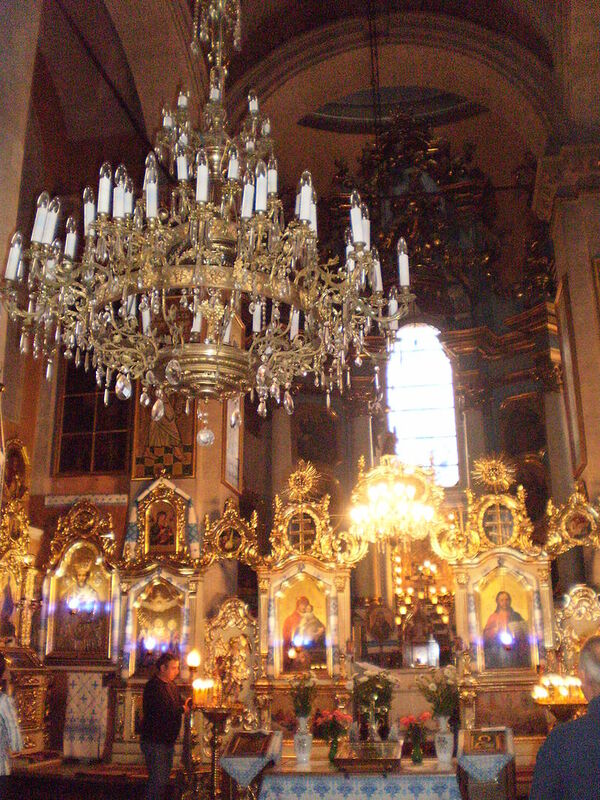 The Dormition Church is the symbolic heart and soul of the Ukrainian people’s relationship with Lviv.